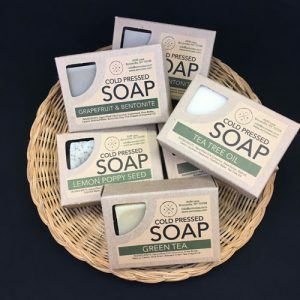 Light and refreshing handmade cold press soaps scented with pure fragrances and natural ingredients including saponified oils (coconut, shea butter, walnut, castor, rice bran). They’re blended with a touch of beeswax for a harder, longer lasting bar. Scents include activated charcoal/tea tree oil, green tea, lemon poppy, tee tree, and eucalyptus mint. All handcrafted by a NY-based artist AVM Casa. VISIT OR CONTACT The Shop at (203) 453-5947, ealbergo@guilfordartcenter.org, to purchase this item.